With only 595 hours, this boat is the most custom and optioned 72' Marquis ever built with stabilizers. Over 200K in electronics &upgrades. Larger never beforeseencustomgalley and bar area with extra refrigeration storage (six drawers between galley and bar area), wine cooler, icemaker & sink. This vessel is a 4 stateroom model with king berth in Master and queen berths in VIP and 3rd Stateroom. Custom colored hull and hardtop with a large custom built 14' tender also fully optioned. United Yacht Sales New Jersey would love to guide you through a personal showing of this 72' Marquis 72 2016. 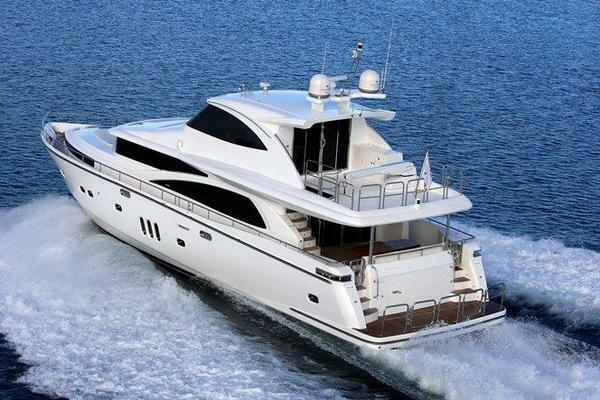 This yacht for sale is located in Aventura, Florida and priced at $2,450,000. For a showing please contact us by filling out the form on this page and we will get back to you shortly! (2) GARMIN 8212 - 12' MULTIFUNCTION TOUCHSCREEN DISPLAY W/ BUILT IN U.S. COASTAL CHARTS.